Charduni dwarves once commanded a vast empire that spanned two continents. The elves, with mighty dragons as allies, were their only rivals. Then the charduni fell from grace, abandoned by the god who had made them, while the elves suffered a titan�s curse and their own god was slain. So it has been since the days of the Divine War. Now, the lost god Jandaveos has returned, lifting Chern�s curse from the elves and filling them with new hope. Meanwhile, the charduni rebuild in hopes of regaining their god�s favour and returning to the path of conquest. This volume provides full details on both races, their histories and their characters. 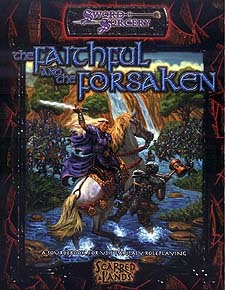 An invaluable addition to any d20 fantasy campaign, The Faithful and the Forsaken provides useful new material for player�s and GMs alike. Requires the use of the Dungeons & Dragons Player�s Handbook v.3.5.